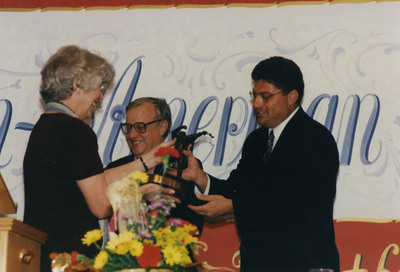 Rosemarie Myrdal presenting an award at the Scandinavian American Hall of Fame Banquet at Norsk Hostfest, Minot, North Dakota, to unidentified recipient. The Norsk Hostfest is held annually in Minot, North Dakota and celebrates Nordic culture and heritage from five Scandinavian countries: Denmark, Finland, Iceland, Norway, and Sweden. Hostfest has grown into one of the largest Scandinavian heritage festivals in the United States.